With its Global Encounter Tour OUBEY MINDKISS is breaking rules by turning things upside down. 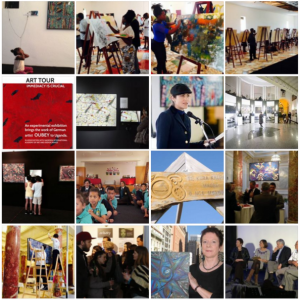 The Tour brings OUBEYs art to places where people meet anyway and for any reason – except the reason to encounter art. That´s an experimental enterprise of a kind. Let´s see what comes next. Stopovers of the Tour have been: A symposium of scientists at Goethe Institut San Francisco (2012) // A public party in Berlin (2013) // An international Conference of Managers in Vienna (2013) // A Maori School Festival in New Zealand (2014) // A normal day at the Central European University in Budapest (2014) // A special day at the International Academy of Art and Design in Kampala/Uganda (2015). The last stopover in Uganda stepped further than any other before: 40 Ugandan artist created paintings, inspired by OUBEYs art. Probably only a minority of people would agree with such a statement; most people would have the diametrically opposed view that life is actually far too short.